Chester boosted their survival hopes with a hard-fought point in the Anglo-Welsh derby against Wrexham. The Dragons' Joe Anyinsah was lucky not to be sent off early on, receiving a yellow card for a late, high challenge on Chester's Kevin McIntyre. Wrexham's Dean Keates and Neil Ashton had efforts saved in a scrappy encounter short of goalmouth action. Chester are two points clear of the relegation zone with two matches left, while Wrexham are 15th. "It was never a sending off. Yeah maybe his [Anyinsah] foot's high and I think the boy's kicked the bottom of his foot, but if you're getting sent off for things like that then I think you're in trouble. "It was a fantastic atmosphere. Clearly we'd have liked to have won it but I felt we stayed disciplined and organised. "It was a scrappy affair and probably overall a draw was a fair result." Match ends, Chester FC 0, Wrexham 0. Second Half ends, Chester FC 0, Wrexham 0. Substitution, Chester FC. Jamie Menagh replaces Lewis Turner. Hand ball by Neil Ashton (Wrexham). Foul by Joe Clarke (Wrexham). Foul by Gareth Seddon (Chester FC). David Artell (Wrexham) wins a free kick. Foul by Danny Carlton (Chester FC). 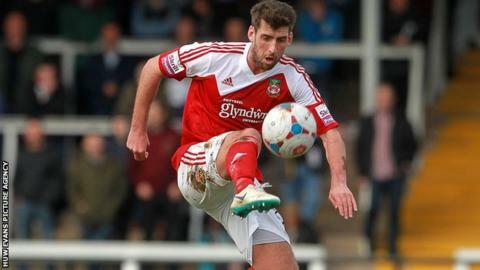 Danny Livesey (Wrexham) wins a free kick. Offside, Wrexham. Andy Bishop tries a through ball, but Andy Bishop is caught offside. Danny Carlton (Chester FC) is shown the yellow card for a bad foul. Attempt missed. Dean Keates (Wrexham) left footed shot from outside the box misses to the right. Bradley Reid (Wrexham) is shown the yellow card for a bad foul. Foul by Bradley Reid (Wrexham). Kevin McIntyre (Chester FC) wins a free kick. Offside, Chester FC. Danny Carlton tries a through ball, but Danny Carlton is caught offside. Substitution, Chester FC. Craig Mahon replaces Andrew Bond. Luke Ashworth (Chester FC) wins a free kick. Attempt missed. Theo Bailey-Jones (Wrexham) header from a difficult angle on the left is too high. Foul by Andy Bishop (Wrexham). Andy Griffin (Chester FC) wins a free kick. Foul by Kevin McIntyre (Chester FC). Andy Bishop (Wrexham) wins a free kick. Substitution, Wrexham. Bradley Reid replaces Joe Anyinsah. Substitution, Chester FC. Luke Ashworth replaces George Horan because of an injury. Offside, Chester FC. Gareth Seddon tries a through ball, but Gareth Seddon is caught offside. Attempt missed. Dean Keates (Wrexham) left footed shot from outside the box is too high from a direct free kick.